Qualified to work in automation? The story of the Cork Institute of Technology (CIT) is repeated in many third level colleges around the country. They have invested heavily in upgrading their Automation Equipment to support the opportunities offered in Automation & Control Industries. That there is a major shortage of Skill automation engineers and technicians is recognized throughout the world. These concerns have been express by major multinational manufacturers, vendor’s of automation products and Integrators as they struggle to find the skilled automation engineers they need to keep the highly automation systems going. There is also a recognition by many companies that the first generation of Automation professionals are now reaching retiring age and the shortage of trained automation people to replace them as well as the loss of there expertese is a growing concern The competitiveness of industry around the world is dependent on the increased level of automation and on reliable support of this 24hr a day 365 days a year. Siemens S7 1200 and Siemens energy monitoring meters. We have a reputation of well educated and trained graduates in Ireland. 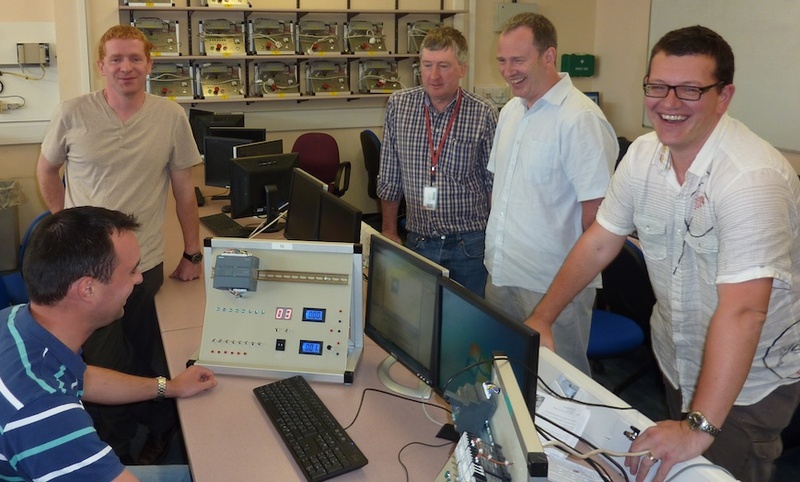 Over the last 10 and more years we have invested in upgrading the equipment and laboratories used by these engineers. The quality of our engineers and technicians is recognised around the world with companies now travelling to Ireland to interview these graduates and offer them positions across Europe. Engineers in responsible positions in many automation, engineering and pharmaceutical companies are in many cases trained at CIT and other Irish establishments. The picture (right) shows one project developed and built by a 3rd year student to monitor and control the dynamics of energy generation using a Siemens S7 1200 and Siemens energy monitoring meters. When I asked about computer simulation for projects, the response were not surprising but still reassuring to hear. The lecturers felt that the experience a student gets from the hands on practical applications gives them a much greater understanding of the technologies involved, and how everything works especially when finding faults that may have occurred or inserted by a lecturer during a class. While mistakes are made by most students it is much better to makes these while at college while learning in a safe environment and they will then be much better prepared for Industry. 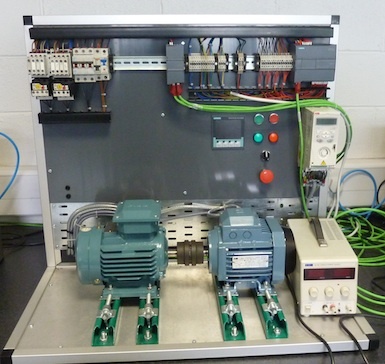 Many other uses are made of this automation equipment with course modules being given on other engineering disciplines. The modules are also used in retraining of electricians and other trades to make them more attractive to potential employers at home and abroad. Declan Lordan is Marketing Director with Douglas Controls & Automation. Joining other companies such as Emerson, Invensys and others, though possibly not as automation focussed, Siemens Industry Sector is now offering an intriguing insight into the work of the industry supplier and related areas of interest in its newly launched blog. Employees from all the Siemens Industry Divisions are using this newly created Internet forum to provide an up-todate look at the topics and products they are involved in, or to report on trade fairs and other events. 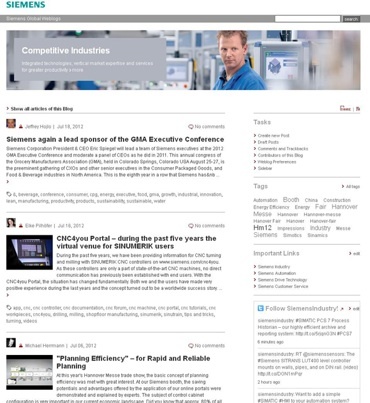 Sporting the title “Competitive Industries”, the Siemens Industry Sector now is present on the Siemens AG blog platform. The published articles focus both on overriding topics such as energy efficiency or industrial communication as well as more specific aspects of the Industry Sector’s work. For instance colleagues from the Human Resources Division talk about ways to ensure a successful entry for newcomers to the Siemens world. The product and technology experts also have a chance to explain the background and detailed aspects of the latest Siemens solutions for industry. The blog also offers a platform to glimpse into the private sphere of Siemens colleagues from 192 countries around the globe who are at home in widely differing cultures. Particularly around the major trade fairs and industry events like the annual Hanover Fair, the blog entries keep visitors and potential customers up to speed with what is happening on and around the Siemens booth. The joint Siemens Industry blog combines topics and issues relating to the Industry Automation, Drive Technologies and Customer Services Divisions as well as the Metals Technologies Business Unit. Readers have the opportunity to add their comments and post questions on the featured articles, and the editorial team does its best to provide a fast and competent response to all enquiries. It is a while since we discussed Stuxnet although we have been updating our last contribution from time to time with links to other blogs and developments as we became aware of them on our blog, “Stuxnet – not from a bored schoolboy prankster!” We have now listed all these on a separate page which we endevour to keep bang up-to-date!. Last week in Las Vegas some more pennies dropped, not so much as to what the implications were but just how unprepared and indeed unaware of the implications of inactivity were particularly on the part of vendors. Black Hat Briefings are a series of briefings on what has become known as the “Infosec” sector. A hackers conference! There was a meeting in Las Vegas in early August and there, security researcher Dillon Beresford, spoke on Exploiting Siemens Simantic S7 PLCs. During this presentation he covered newly discovered Siemens Simatic S7-1200 PLC vulnerabilities. He demonstrated how an attacker could impersonate the Siemens Step 7 PLC communication protocol using some PROFINET-FU over ISO-TSAP and take control. Byres concludes his blog: “As Dillon clearly showed this week, vendors doing nothing and then hoping no one will find their product issues is no longer an option. You can count on ICS and SCADA vulnerabilities been publically exposed. Automation Summit! Missing the security boat? We feel we have been a bit remiss in providing our coverage of User Group meetings this past month.Partly this is becaues of our travelling and attendance at the ISA Summer Leaders’ Meeting in St Louis (MO US). Here we give some comments and links from the Siemens Summit and later in the week we plan to have something on the Honeywell User Group #HUG meeting in Phoenix (AZ US) later in the week. Navigating the world of automation! 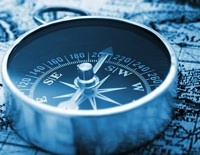 “Navigating the World of Automation” was the theme of the Siemens US 2011 Automation Summit held last month in Orlando Florida. That security was one of the topics is of little surprise given that the Stuxnet problem was first discoivered in their equipment just one year ago. (Indeed an article by Nick Denbow of IAI “Stuxnet – not from a bored schoolboy prankster!” has proved to be one of the most visited articles on our site and we have continued to add links to other articles on Stuxnet & Security issues on that page). “They walked into the Lion’s Den and came out unscathed. Two security experts went into the 2011 Siemens Automation Summit and talked about lessons learned during the Stuxnet affair” so starts Greg Hale in his Summit Report, Analyzing Stuxnet with Siemens. See more on the Summit from the 30th June’11 issue of his publication The Shield. Renee Robbins Bassett from Automation World was also there, “in the land of Micky” as someone called the venue and one of her posts concentrates on Siemens permiation of Disney World’s Orlando site as she says that Siemens is “Almost Everywhere” in Walt Disney World. Nevertheless as a further report from the same source says the first-day announcements seemed all about process industries and Siemens’ process instrumentation and analytics offerings (Siemens Targets Process Industries in a Big Way!). Walt Boyes of ControlGlobal also looks at the Disney aspect when he reported on David Van Wyk’s keynote, sharing the Disney Imagineering project management process, he’s the boss of this area at Disney’s. We like the word “Imagineering” too! In Stacey Jarlsberg Points the Way, Walt reports on the Siemens DCS offering. “Whither PCS7?” he asks. He concludes this article with “Last, but most importantly, there are significant improvements in cybersecurity in PCS7.” In view of Eric Byres comments of the 6th July mentioned above, one wonders how credible this view may be. It appears that for some the answers appeared to arrive too late at least for this particular event! • Bill Lydon, Editor of InTech interviewed Raj Batra, President – Industry Automation of Siemens Industry in the U.S. and Adreas Aufenanger, General Manger of the Process Automation Business in this Executive Interview for Automation.com. Kieran Coughlan (ISA Ireland), John McKeon (Astellas), Michael Lawlor (Genzyme), Charlotta Johssen (Lund University Sweden) David O’Brien (President ISA Ireland) and Barry Lawlor (J&J Jannssen Biologics). 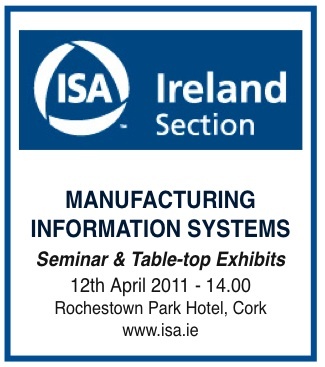 The Ireland Section of the International Society of Automation had a very successful half-day seminar in Cork city on 12th April 2011. 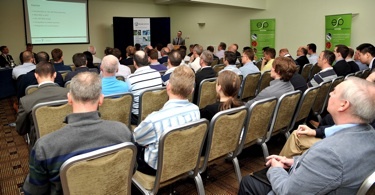 The over seventy attendees were very positive about how the event went. For a volunteer led function it was remarkably professional and smoothly run. I thought the event was good as it bridged the gap between automation & information/execution systems; or IT versus Engineering if you like. A different perspective. As a Mechanical Engineer dedicated for years to IT, it is nice to see the dots joined! The subject matter was interesting and drew a substantial number of the user community especially but not exclusively the pharma sector. The fact that the speakers were not aligned with any particular vendor and included actual users made the event more attractive and useful. First off Barry Lawlor, Janssen Biologics (J&J), spoke on the development and roll-out of a core MES Solution across the J&J global pharmaceutical supply group. He addressed the initial plan, its ongoing execution and the future development plans. Michael Lawlor of Genzyme followed with the view from the Pack Line level up in design, selection, and integration of a Serialisation/Product Security Project. He drew on his experience in leading several projects as well as been on the integration team of the MES system to the Production Systems and Automation Lead on the Corporate Serialisation Project. This project was initiated in late 2007 and is still running today in the implementation of French market CIP13 requirements. Each speaker was presented with a commemorative plaque! The next speaker, Dr Charlotta Johnsson is Associate Professor in the Department of Automatic Control at Lund University (S). She is also a voting member in the ISA SP88 and ISA SP95 standardisation committees. Her contribution to te event was a valuable insight into Make2Pack and ISA88-part5, where the standarisation is coming from and where it hopes to go and how the standards are arrived at. She also gave a brief outline of ISA 95 developments. Finally John Mckeon, an engineering professional who has worked as a consultant to Astellas Ireland for many years. He has worked in a number of automation and system integration projects, including their response to counterfeiting and the implementation of track and trace. His talk was a fascinating expose of global serialisation, anti-counterfeit and track and trace. He outlined the different regulations and standards in different countries and regions and their impact on production and supply. The local ISA President, David O’Brien concluded afternoon’s proceedings by thanking all involved, speakers, sponsors, those who attended and particularly the committe of volunteers, especially Kieran Coughlin who did trojan work to make the MIS Technical Seminar a great event for the Section. The sponsors of the event were Rockwell Automation, Emerson Process Management, Zenith Technologies, Crest Solutions, nne Pharmaplan, Enterprise System Partners, and Siemens. Large pictures fro Creative Photography! We missed (again) the biggest automation event of the year in Nuremberg (D) this year. There are only so many things one can do and with the proliferation of user group or company sponsored events in the final four months of the year it is difficult to spread the limited resources – both fiscal and physical – to cover everything. That is why we try to use the social media resources to cover so many of these events. An unbroken rush of visitors! 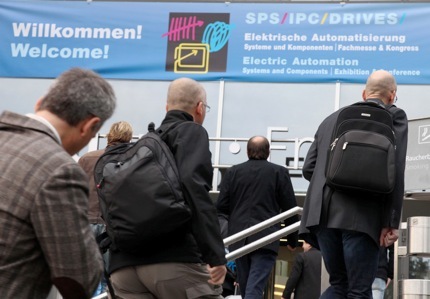 The SPS/IPC/Drives has been consistant in delivering a very useful and practical showcase for the European and Global automation market for many years. This year was no exception. 52,028 trade visitors poured into Nuremberg and chose this exhibition as their highlight of the year for the electric automation industry. During the three days of the show the industry showed its condensed ability and its optimism which it will use to profit from the positive economic situation. Indeed the boyancy of the show belied the gloom and doom of the mass media predictions of the economic state of Europe. Especially the increase in visitors from abroad was significant. 10,147 (+34%) came to inform themselves about the offers of 1,323 exhibitors. Last year we reported on this show too – Major show in the heart of Europe – and this year topped it in size with nine halls full of automation and having to fight your way through the crowds to see what you wanted to see. One of the most complete reports is from Leo Poner’s Industrial Ethernet Book in their SPS/IPC/DRIVES 2010 Show Report published on 7th December 2010. They report that the shopw emphasised green issues and security. Microsoft listed Windows Embedded Partner Innovations Showcased at the show. Carl Henning, the ever-active ProfiBus US guy, put two contemporaneous reports on their stand on his ProfiBlog. Both offer a pictorial guide to the stand entitled “Technologies in the PI Booth” and the next one “Welcome to the PI booth” They are good pen pictures support with generous pictures and videos of what one stand’s experience was. He also alludes to the US automation journals who sacrificed time so close to their beloved Thanksgiving festival to report on this event. He may have another report. This and some of their reports will appear below appear below, newest at the top. Automation World’s Gary Mintchell’s Mintchell Report comments in living colour on his way home from the show on key trends and new products from Siemens and Beckhoff are highlighted. He also has a few pictures on his Flikr page: SPS-Drives Trade Fair Nuremberg. The next SPS/IPC/Drives 2011 show is scheduled for 22 – 24 November 2011, so mark your diary. Britain to lead offshore wind market? Frost & Sullivan’s Wind Energy Industry Analyst Gouri Kumar has commented on the news that Siemens plans to invest about £80m in a manufacturing plant to manufacture wind turbines in Britain, creating more than 700 jobs. “A combination of factors such as the UK government’s efforts to attract these companies to set up plants in the UK, the support to the offshore wind industry in the recent UK budget as well as the announcement of Round Three offshore wind project leasing, has sent the right signals to the market about how serious the UK is about developing the offshore wind market. See also UK energy sector is getting the wind up in HazardEX.